As Learning Consultants we need to understand why our customers want to implement new or innovative learning approaches. In most cases cost reduction is still the number one, and sometimes only reason. However well implemented new learning approaches taking advantage of modern technology and proven teaching styles, lead to increased student performance thereby producing less “Learning Waste”. In my other blogs I have been writing about some approaches to “New Learning”. Those articles provoked more questions on what would be the ideal methodology for learning development. Recently I have heard much confusing use of terminology such as social learning, blended learning, collaborative learning, inclusive learning, .. and recently flipped classroom. I have been asked in many occasions to help integrating one of those “hypes” in both corporate and educational institutions. You can imagine that implementing hypes is not a sustainable business. First we need to discover what we want to achieve with learning. Implementing best practices from different learning frameworks is better than believing in one ideal approach. New Technology – New Learning? Some say that in today’s dynamic classrooms, whether they are corporate or educational organizations, the teaching and learning process is becoming more influenced by the rise of new technologies.Knowledge about effective learning spaces and implementation of technology-enabled teaching/learning would be key to understand before we select a framework for learning development. My opinion on this is that we don’t need to fully understand technology. Understanding our audience is the key differentiator in developing learning. Just as in marketing we will select the appropriate channel according to our target group and their learning preferences. Believing that technology will shape learning of the future is an illusion, technology can be a “hub” to deliver all kinds of learning and to measure effectiveness and efficiency. So what is new in Learning? Another new learning hype we hear regularly is collaborative learning or social learning that is taking advantage from new technologies for peer coaching, e-coaching and social networks. I would like to point out that Peer Instruction using technology was developed in 1991 by Harvard professor Eric Mazur as he believed that computer-aided instructions allowed him to coach instead of lecture. Eric Mazur developed a questioning procedure to involve students and take ownership on their learning. Students were prepared to learn outside the classroom by doing pre-class reading and answering questions about those readings. Then, in class, the instructor engages students by posing prepared conceptual questions or concept tests that are based on student difficulties. During the time in class the students will than discuss with peers their personal difficulties and answers. Indeed this is different than what we see today as learning has become administration and content focused. Learning Management Systems are hardly student-centered, collaborative or empowering. Just in Time Teaching (JiTT) is not new it was developed in universities in the early 90’s to engage a particular audience – non-traditional students. JiTT is designed to motivate students and to apply newly constructed knowledge that is acquired through team-work in a debate-like environment. Those non-traditional students needed to learn when they had time or when they needed something for their personal or professional development. They wanted to learn with and from peers and experimented with non-linear or formal lecturing methods. Peer instructions and Just in Time Teaching are both Flipped Classroom approaches as they free class time for hands-on work. Students learn by doing and asking questions. Students can also help each other and learning is not bound to physical spaces or time. Flipped Classroom is a forms of blended learning in which students teach and switch roles with teachers. Recently I was asked to help implementing a Flipped Classroom approach for one of my customers and almost wanted to refuse. When this method is limited to replacing the order of homework and classwork the classroom is flipped however the learning not. I have found examples where Flipped Classroom was used in the 90’ies placing the learner in the driver seat hereby taking ownership of his own path with the faculty as a coach on project or case based learning. This strategic flipping where roles were exchanged was referred to as “Flip Learning”. You can imagine that this approach was combined with peer instructions and the use of technology such as video. According to Wikipedia, blended learning is a formal education program in which a student learns at least in part through online delivery of content and instruction with some element of student control over time, place, path or pace. So the above all have a blended approach to the theoretical definition of the methodology. However when I talk to people they refer to blended when wanting informal learning and coaching. Jennings’ 70-20-10 is a hype in corporate universities and I have people seen worshipping this as it was “the new thing” we all need to incorporate. However most of the initiatives I have seen are a mix of formal learning ideas without any peer learning, collaboration or flipping in any form. (E)coaching or peer-coaching is added without any empowerment of the learner. If anything has been around longer than you would expect it is distance learning. The earliest references are found already in the 18th century in Europe where students could follow weekly send lessons per mail. Later when technology emerged video learning was used to blend those formal learning events with traditional distance education. Salman Kahn introduced his video based distance academy in 2006 and made video learning (or e-learning) even more popular with over 10 million students in 2013. The most recent and hyped versions of distance learning are Massive Open Online Courses. MOOCs are aimed at large-scale interactive participation and open access via web or other network technologies. Typically, students enrolled in a MOOCs watch video lectures – often sliced into digestible 10 or 15-minute segments – and interact with instructors and fellow participants in online forums. Some MOOCs are blended with online tests or quizzes with multiple-choice answers that can be graded automatically, while others require students to complete peer-reviewed assignments. Coming back to what learning methodology you should implement I can be very brief; “Your own”. Just think about what it is your learners need to achieve and why they need learning and knowledge. Only when you understand your audience you can bring value to them. Involve them in the development process, ask them to co-create learner generated or validated content and empower them to take control over their own development. Not all people have the same needs or preferences, so how could one methodology work for all of them? 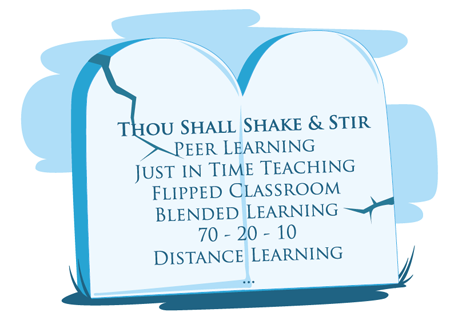 If you want to develop a “lean” framework where any learning activity that doesn’t directly help a learner to perform better is eliminated, take a blender and build your own “blended” learning approach.